‘Pink Lady’ offers up the perfect combination of fast growth, beautiful evergreen foliage and masses of fragrant blooms. ‘Pink Lady’ is an excellent specimen for sunny foundation plantings, accents in mixed borders or even as massed plantings in low-maintenance areas. Foliage emerges a bronzy-red color, then turn a deep green. Fragrant pink blooms emerge in spring into summer. Birds and butterflies love the blooms. Plants have an attractive natural rounded shape. It’s best not to shear ‘Pink Lady’; hand pruning to maintain plants size will help maintain the attractive look of the plants and preserve the flowers. Shearing not only damages the foliage but removes the flower buds. 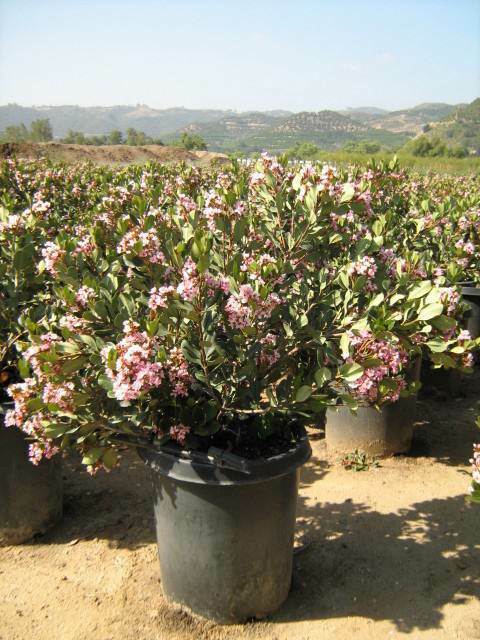 Plants perform best in a sunny location and can tolerate hot, dry conditions. While plants can tolerate some afternoon shade, too much shade often causes plants to become leggy and stop flowering. Keep irrigation and the soil-level, as water on the leaves, especially in shadier conditions, can lead to fungal disease.